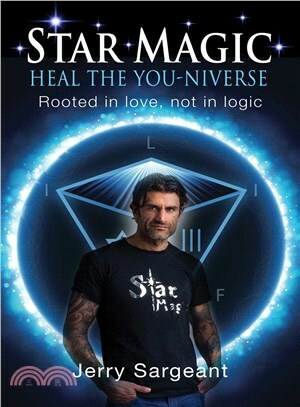 Star Magic is the healing modality for healers or anyone wanting to explore their own YOU-Niverse and unleash their full human potential. Working at a level of super-consciousness, by harnessing extra-terrestrial light and sounds codes, traveling through the ether, Jerry Sargeant will show you that what were once miracles are now everyday occurrences. After a serious road traffic accident, a trip in a space ship to access off planet light frequencies and months spent in Ancient Egyptian Mystery Schools, Jerry was shown how to heal using the information contained within extra-terrestrial light. You are about to embark on a powerful journey that will transform your life, forever. Star Magic is a formula, a flexible formula but it’s not a system. It’s a disciplined, non-systematical way of knowing, and this formula can be adapted to suit every human being in their own special and unique way. Tumors, cysts, fibromyalgia, eyesight, hearts, hemorrhoids, broken bones, nervous systems, and much more have been healed. They simply disappear as though they were never there in the first place, or mend as if by magic. Star Magic is also used to elevate business performance, remove blocks in relationships and so much more. If you’re not satisfied with life, you must get to know Star Magic. Sit back and ride the rhythm and vibration of time, sound and energy, assuming you are ready to leave behind everything that you have even known, been taught or made to believe was real, if you are ready to be swallowed up by a world that knows no logic, yet makes perfect intuitive sense, and if you are willing to open the channels of communication with Ancient Civilizations, our beloved allies of the Spirit World, who guide the author day in day out to perform distance healing, and incredible feats of psychic surgery. The energy of Star Magic is so potent, so powerful that it’s desperate to expand. It flows up, out, into the Star Magic Matrix, from each human being and without human touch. Now it has started, it cannot be stopped. It will ebb and flow throughout each atom in the Universe and enlighten, heal and transform humanity. Star Magic is the most powerful transformational tool available, yet it cannot be held, touched or grasped. It’s intangible yet more real than the fingers that are pressing the buttons on this keyboard right now, sharing these words with you. Are you ready to love? Are you ready to heal? Are you ready to experience the truth? Jerry Sargeant discovered the ability to heal after a serious road traffic accident, led him on his spiritual journey where he remembered the power of Star Magic. Using an extra-terrestrial light frequency Jerry has successfully removed tumors, restored eye sight, dissolved fibromyalgia and more.